Kruger Park South Africa is a true African safari experience boasting unrivalled game viewing. Kruger Park covers almost 2 million hectares where you can enjoy the animals, birds and plants on a Kruger Park Safari. Whether a luxury Kruger safari, Guided Kruger safari, Lion Safari, Elephant safari, Self drive safari, walking safari, birding safari or just to connect with nature Kruger Park is the place. Price Guide per person per night based on two people sharing. For best price please email our experts who will get the most competitive quote available for your dates. In Kruger National Park nearly 2 million hectares of unrivalled diversity wildlife, flora and fauna fuses with historical and archaeological sights - this is real Africa. We love The Kruger National Park and the wonderful animals and birds that can be seen in the wild here, and we are lucky enough to have our main office only 30 minutes from the Kruger Park, this means we are on the ground to find out the best prices and nicest places for you to visit on a safari holiday to Kruger Park. Guided Safaris excellent viewing of the Big 5 - Lion, Leopard, Elephant, Rhino and Buffalo. From rustic comfort to exclusive luxury wonderful game viewing, excellent birding. Self-drive Kruger Safaris are only available in the government run section of Kruger National Park (part of South Africa National Parks or SANParks) and not the private greater Kruger reserves. You must stay on the marked roads. We can arrange reliable vehicle hire for you either from the airport or at Kruger where you can collect and return the vehicle. For a Guided Kruger Safari, head to the privately run reserves, concessions and lodges. At these lodges expert rangers and trackers will share their knowledge of the South African wildlife and bush with you either on open safari vehicles or on foot if you would like to take a bush walk. There are also lodges which specialise in walking safaris in the bush. A Luxury Safari gives you the ultimate safari experience with top quality accommodation, meals included, expert rangers and guides and the ability to get you close up safely to all the amazing wildlife of the Kruger Park, with almost guarenteed viewing of all the big five and complete interaction with the bush and all the wonders it has to offer large and small. Your Kruger Safari accommodation and the rangers who will look after you while you are on safari are very important to the success of your trip. We have visited all the lodges we recommend and we try to match peoples requirements and budget to the Kruger lodges available, from Kruger camp sites to 5 star luxury lodges there is a style for everyone. If this is your first visit to the African Bush and want to get the most out of your safari then the most important factor to the success of your safari may well be your safari guide, and there is no-one better qualified for this than an experienced and well trained wildlife ranger. At the private Kruger Safari Lodges it is the experienced rangers who will guide you through the African bush and act as your safari guide. These rangers are not only responsible for sharing their beutiful bushland with you but in the everyday management, protection and care of the wildlife in their section of the Greater Kruger National Park and so they all have a unique insight, knowledge and love of the Kruger park to share with their safari guests. We regualrly visit these areas, inspected the hotels, lodges, camping places, restaurants, and have taken all the photographs on this website, spent many enjoyable hours game driving and game viewing around Kruger, now we offer all you this information to plan your safari to Kruger with the best advice possible. Although we are an internet company (keeping overheads and costs down) we believe in good old fashioned service and we base our business on honesty, professionalism and friendliness offering you the value benefits of an internet company combined with personal service from a travel consultant ( a real human who cares about making sure you have the best possible experience in Kruger) who knows what they are talking about. So please browse through the website and email us with any questions, and to make a booking for any of the hotels, lodges, camping sites, activities or flights just email us and we will find the best price for you and advise you on which places are suitable for your requirements. So let us do the work while you enjoy all that Kruger National Park has to offer because there is so much to experience in the Kruger and we aim to make it as pleasant and easy as possible for you to share in that beauty. South African National Parks (SANP) is government funded and runs the largest section of Kruger National Park (KNP) which can be split roughly into the most visited south and quieter north. In both parts of the park SANP rest camps provide basic rooms, self catering and camping which are very popular and must be booked well in advance. There are also a number of private kruger concessions within the SANP area which provide accommodation in privately run lodges and private game drives and walks. For the ultimate luxury safari look no further then Sabi Sand Reserve, characterised by its luxurious and historic lodges such as Mala Mala, Kirkmans and Sabi Sabi who have been sharing the beauty of the African bush for generations. Close encounters with wildlife are guaranteed. he game is free to roam freely between all these reserves and Kruger National Park granting excellent viewing of the Big 5 - Lion, Leopard, Elephant, Rhino and Buffalo. A Safari in the Timbavati Reserve gives you the chance to see all these and more from open vehicles and on foot. Start the day with a game drive and end the day dining under the starry sky. With wonderful game viewing, excellent birding and a variety of small lodges there is something for everyone in the Thornybush Reserve. This special place will captivate your heart. 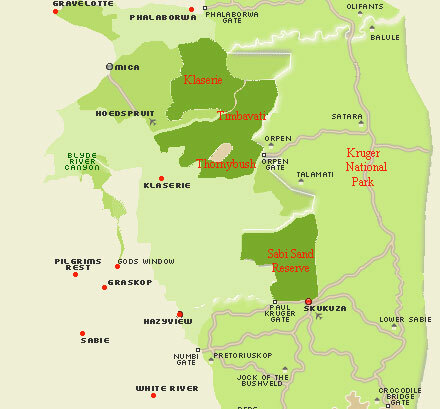 The Klaserie Private Nature Reserve is part of the Greater Kruger National Park. The reserve lies to the west of the Timbavati covering 60 000 ha on either side of the Klaserie River. The private nature of this wilderness sanctuary enables one to embrace the African bushveld in one's own time - to take in the sounds, sights and smells that make the bushveld such a unique experience.